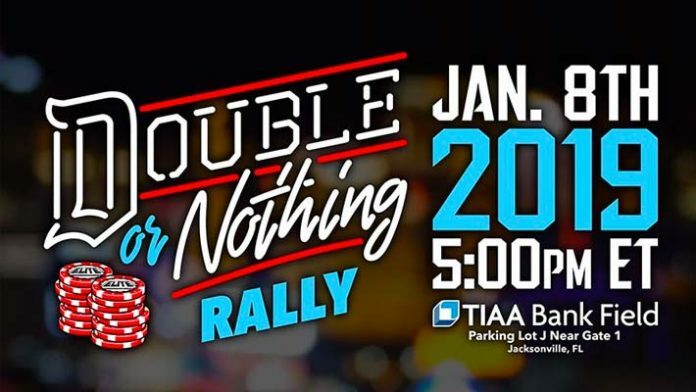 All Elite Wrestling’s Double or Nothing rally takes place later today at TIAA Bank Field in Jacksonville, Florida. Starting at 5pm ET. AEW executives were in Jacksonville on Monday afternoon scouting out the location. AEW Executive Vice President Cody Rhodes tweeted these photos of himself with AEW President Tony Khan and his wife, AEW Chief Brand Officer Brandi Runnels. Scoping out the site of tomorrow’s Double or Nothing Rally! On Monday, it was revealed that Being The Elite regulars Christopher Daniels, Frankie Kazarian and Scorpio Sky have signed with All Elite Wrestling. The SoCal Uncensored trio confirmed on Twitter they are headed to Jacksonville for the Double or Nothing Rally. At the very least, we should get some concrete information regarding the date and location of All Elite Wrestling’s inaugural event, Double or Nothing. The most prominent rumor is that Double or Nothing is headed to Las Vegas during Memorial Day Weekend (late May), but that is simply a rumor at this time. AEW is hyping, “attendees can expect the unexpected as the rally will showcase the true spirit of wrestling entrepreneurialism and feature special guests, inside info and limited edition merchandise.” Fans are already speculating about what sort of guests will be showing up. One man who can be ruled out is Kenny Omega, who remains under contract with New Japan Pro Wrestling through the end of the month. Omega has announced he is leaving New Japan and considering jumping to AEW or WWE. Signing the Best Bout Machine would be a tremendous coup for All Elite. That said, we don’t know if Omega has decided his next move. Even if he is leaning towards joining AEW, he would need the blessing of New Japan to appear at the rally. SEScoops will be covering the Double or Nothing Rally this afternoon. Check back later for our coverage.